Hopping aboard a Windsor Essex Trolley Tour offers a whole new way to explore the wineries located along Lake Erie’s North Shore.The trolleys, affectionately known as Destiny and Desire, will whisk riders away in air-conditioned comfort, allowing them to hop on and hop off at the wineries of their choosing. What follows is blogger Tracey Nesbitt&apos;s account of her experience touring the region&apos;s wineries by trolley car. This was the most common response I received when I told friends that I was heading to Ontario’s Southwest to explore the area’s wine and food. And to be perfectly honest, when I boarded the train in Toronto and headed west, I was not at all sure what I would find. Awaking the next morning to a sunny day, I headed to the parking lot of the Windsor Crossing Outlet Mall, the departure point for the wine tour that I had been looking forward to for weeks. I boarded the trolley, and off we went. On this particular tour, all of the passengers were women, including a couple of bridal parties and people celebrating birthdays. It was an easy trip to take part in as a solo traveler – there were lots of people to meet, a designated driver, an organized lunch and tastings at a selection of local wineries – and everything was included in the cost of the ticket. All I had to do was show up! The first stop on the tour was Viewpointe Estate Winery in Harrow. 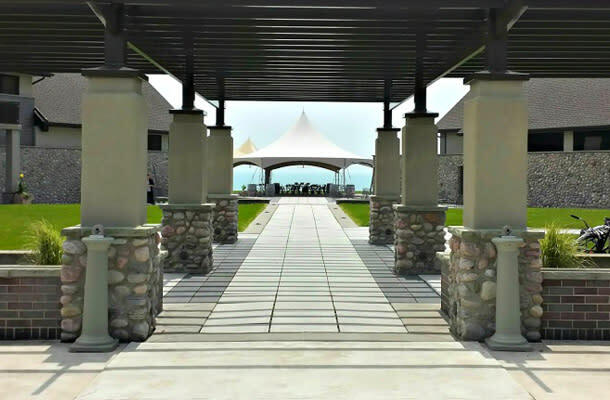 The setting for the winery itself was lovely, with unobstructed views of Lake Erie and a large outdoor patio space. After being led through a tasting of a few of their wines, our group headed out to the terrace for lunch. A warm sunny day, a view of the lake, a cold glass of Viewpointe’s Auxerrois in hand – what a way to start a Sunday afternoon! A quick stop in the winery shop to pick up a bottle to take home, and we were back on the trolley. I learned something new about tasting wine in Ontario on this trip. Apparently, the wineries are only allowed by law to serve 4 tastings per person. I have not experienced this anywhere else, so I was disappointed to discover that I couldn’t taste additional wines in the shop before purchasing. For future reference, be selective about which wines you taste, and only taste the ones that you are really interested in. The winemakers want you to find the wine that you love, so don&apos;t be afraid to ask. The Hop On tour that I took was provided by W.E. Trolley. They have a variety of routes and wineries to offer, and the tours run on Sundays from June to October. I am highlighting my two favorites from this trip, but check their website to see the full range of options. It was fun to ride in something other than the typical bus - though I don&apos;t know how our driver survived 30-odd women who were already in a celebratory mood before we set out, and then had multiple wine tastings added to the mix. Let&apos;s just say that the volume increased as the day progressed! Cooper’s Hawk Vineyards is doing something a little bit different. 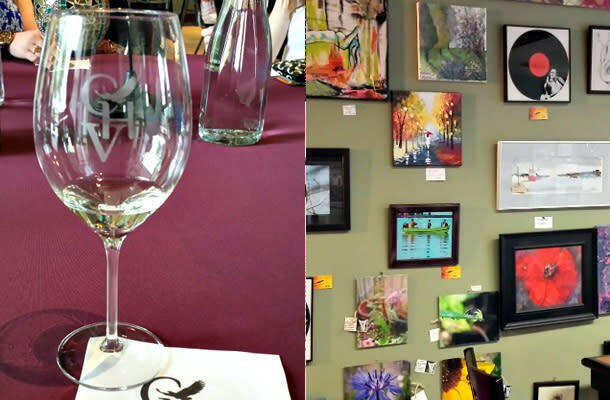 While you can taste wine indoors, they also encourage visitors to choose a glass of their favorite wine and enjoy it while wandering the grounds or sitting in the sun. They even have a play area for children. I love this casual approach. Wine tasting can sometimes feel a bit intimidating, but not here. I was also delighted to discover that I really liked their Pinot Noir, a grape I&apos;m generally not enamored with. My suitcase got a little heavier at this stop as well. At the sit-down tasting at Cooper&apos;s Hawk, we were told about their plans to build a new restaurant. I would love to plan a return trip once it opens. I decided to spend the night at The Woodbridge House, a B&B in nearby Kingsville. This beautiful home, built in 1881 and lovingly restored and upgraded, is a gorgeous and restful place to lay your head after a long, hard day of wine tasting. In addition to all of the antiques, the house is filled with work by local artists, most of which is available to purchase. Even though I was not in a position to buy anything, it was lovely to be surrounded by such an interesting array of work. After a bit of a break, I headed out for some dinner. It felt like a steak was in order – accompanied, of course, by more local wine – so I decided on Mettawas Station. Focusing on Mediterranean cuisine, this restaurant is housed in the former Kingsville Train Station that was built in 1889. It has a beautiful wrap-around porch, where I desperately wanted to sit, but the weather did not cooperate. However, the interior was just as attractive, the steak was great, and the staff were fantastic – my server even very kindly charged my phone in the kitchen for me between courses. After a good night’s sleep, I awoke to another delicious meal. As I was the only guest at The Woodbridge House on this day, I had the entire dining room to myself. Which is a shame, because the breakfast was so good, it deserved to be enjoyed by more people. Fresh asparagus, local Mennonite sausage, phyllo pastry stuffed with cheese and greens, watermelon and cucumber salad, tomato salad, fresh-baked rhubarb crumble, a pot of coffee…it was a far cry from what I grab on the go at home. What a treat! I had a bit of work to do, so I headed to Merlis’ Coffeehouse and Eatery. What an interesting place this turned out to be. In addition to offering fair trade, organic coffees and quite a large menu of home-made goodness, there was a lot to look at in this café. The walls are literally covered from floor to ceiling with the work of local artists. All of it is for sale. In speaking with one of the owners, I discovered that they only retain a tiny commission on sales, and then put it all back into an event to showcase the artists as part of street festival each year. Such a great idea. I was determined that I would try some local fish on this trip, and I found it at Jack&apos;s Gastropub. It also seemed important to taste something other than wine, so I washed it down with their house beer, Banded Goose. Lake Erie Yellow Perch, especially when it&apos;s prepared Jack&apos;s way, coated in Panko and flash-fried, is every bit as delicious as it sounds. They, too have a wraparound porch, and although it was also raining on this day, the porch was covered so I was able to sit outside. On my way into town that morning, I had realized that the Pelee Island Winery was just a short walk from The Woodbridge House. Although my plan had been to visit Point Pelee National Park that day, the weather was just not working in my favor. So, poor me, I had to do one more wine tour. Well, what&apos;s a girl to do? Because this trip was, for me, about discovering new wineries, I hadn&apos;t considered visiting Pelee Island&apos;s Kingsville location since I live in Ontario, and can buy their products in my local liquor store. So, while it was interesting to discover that they are one of the largest wine producers in Canada, and to go behind the scenes to see their facility (which is separate from their vineyards, which are located on Pelee Island), I really preferred getting out to see the grapes growing in the fields. 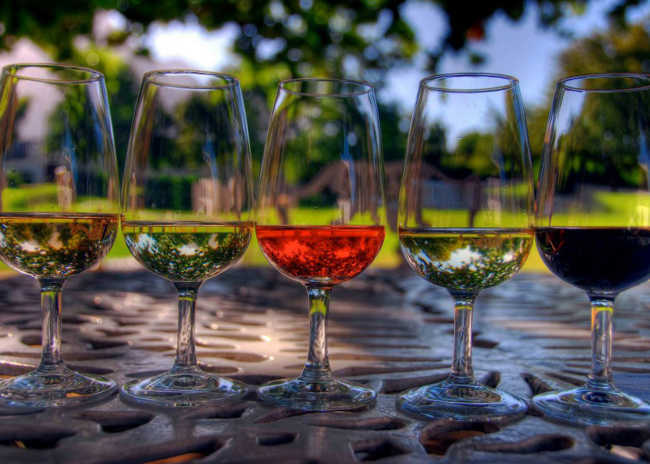 This time, though, remembering the rule that I had learned about the number of tastings allowed, I focused on trying wines that were only available at the winery, avoiding those that I could purchase at home. This made the tasting more special, and allowed me to discover wines that I could only have there, and to pack a couple in my suitcase. Everywhere I went on this trip I encountered wonderful, sometimes astounding, friendliness and hospitality. From the lovely mother and daughter I met and ate lunch with on the wine tour to the trolley driver who whisked me off to my B&B when I discovered that there had been a mix-up in my travel plans to the amazing Michele at The Woodbridge House who drove me all the way back to Windsor when I discovered that there was no public transportation to get me there, the people of Southwestern Ontario treated me very, very well. Note to self: do not attempt this trip again without a car. I was also surprised by the number of wineries in this area, my lack of knowledge about them, and the quality of what they are producing. While naturally, not everything was to my personal liking, I came home with at least one bottle from each of these wineries. And since the trolley tours visit different vineyards on different dates, I could go again (and again) and have another day of new discoveries. Transportation - I thought that the W.E. Trolley was a great deal: transportation to three wineries, tours and tastings at each, lunch at one of the wineries along the way, and a surprise soft ice cream stop, all for $75. Check their website for itineraries and to book tickets. Wineries - Check their websites for locations and hours. 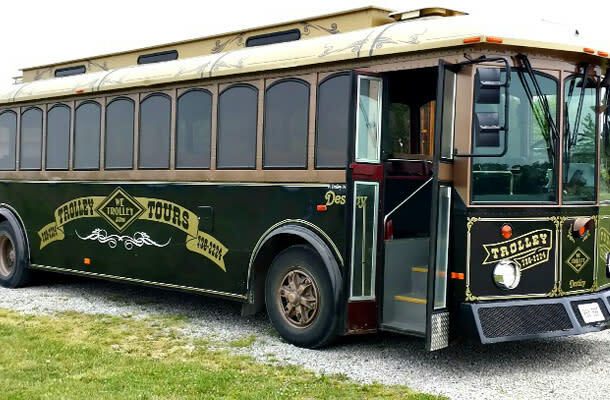 If you&apos;re not taking the trolley - though I recommend it for the built-in designated driver - you can arrange your own tour with the winery. Restaurants - All of the restaurants that I enjoyed were in Kingsville, as I was on foot. You can find out about other places to eat on The Foodie 15 website, dedicated to the food and drink of Ontario&apos;s Southwest. Accommodation - From the art to the food to the comfortable bed, The Woodbridge House was a wonderful place to stay. Tracey Nesbitt is a writer, editor, food and wine fanatic, and traveler. She is the editor and food & wine travel columnist for Solo Traveler and can be found eating, drinking and cooking her way around the world. Follow Tracey as she travels across the world, discovering fantastic food and delicious wine at solotravelerblog.com.